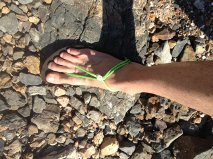 I recently took delivery of a new pair of Gladsoles trail 2.0 barefoot sandals. Gladsoles website simply calls these Trails, I’ve added the 2.0 to differentiate from the first pair of Gladsoles Trails I owned as the sole is different and the run is slightly different. Don’t be confused if ordering these, you’ve been warned. The Gladsoles trail 2.0 is an 8mm Vibram Gumlite sole custom made to your individual tracing of your feet that ensures a perfect fit. They are a natural zero drop huarache sandal. 8mm is not a lot of rubber under foot, but it is enough and it’s enough to give you a great running experience. In the time I’ve owned these sandals I’ve given them 79km of use. 79km over seven runs on a variety of terrain. First thing I notice about these sandals is they are slightly less flexible then the previous Gladsoles I’ve run in. This was reiterated by Rich at Gladsoles when I asked the difference in the sole, in his words, the Vibram Gumlite sole is denser and will take longer to cold to your foot but provide slightly more protection. The denser sole certainly takes a little longer to mold to your feet however this doesn’t impact comfort a whole lot in the early runs. Straight away these sandals felt very familiar and easy to run in, once lacing was perfected the running experience is very natural. It is true to say that sandals become better the longer you wear them, my last pair ran 1100km in total and only as the sole started to break down in the last 100km did they not feel great. I anticipate this denser sole will last more than 1100km. The absence of a mid sole compared with regular running shoes is the reason why they last longer. The Vibram Gumlite sole definitely gives more protection from objects under foot. This is a big plus for this sandal, the extra protection allows for a more confident foot landing over trail terrain in particular. Ground feel is still amazing despite the extra protection and slightly less flexibility. I have run a number of runs over road, trails and beach in these sandals so far and been very comfortable in them on all surfaces. Being winter in Australia I have completed these runs in Injinji toe socks as most of my running is done in early morning and cool conditions. I have run two 20km + long runs in these, a 5km race, a hill repeats session and a number of aerobic runs to give them a variety of runs. The slightly less flexible sole has no impact on the running experience, the Trail 2.0 is a joy to run in, they give a pure barefoot running experience allowing the foot to move freely in its natural state and is not limited or controlled at all by the footwear. This denser sole offers a more confident ride which should translate into faster running over longer distances. 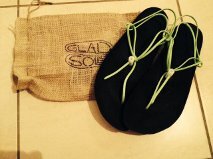 The fit of Gladsoles is perfect, being custom made to your tracing the fit simply couldn’t be better. Getting the lacing correct is important though and will take a few attempts to get the feel right, once this is achieved they feel like an extension of your feet. The vast majority of my runs is now done in these sandals as it was with the previous trail model. Currently in the early stages of a marathon preparation and these sandals will be my footwear of choice for all my longs leading up to this race and the race itself. the race is a beach and trail marathon with a large variety of terrain changes throughout, i have no doubt that the Trail 2.0’s will help me get the job done in training and on race day. If you are transitioning from a regular running shoe with a high heel differential be patient. 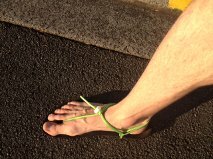 The barefoot running experience will change your life for the better if you transition correctly.